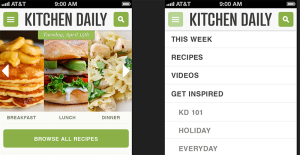 One of our flagship AOL client sites, KitchenDaily.com decided that they wanted Ashe Avenue to implement a responsive solution. We’ve been rolling out more responsive sites lately (including AsheAve 2.5) so we were excited to get this excellent site working smoothly on devices of unusual sizes. When the designs landed, we were slightly taken aback – the AOL design team had gone for an aggressively ‘app-like’ look and feel, including menu reorganization, reflow of some pages, adding new icons and much more. That said, since it was a really beautiful design, the challenge would be well worth it.. After some discussion about timelines, we decided to break the responsive build in two, saving all of the user-based elements for Phase Two (As of late-July a work in progress). In addition, the designs had the unusual feature of being smartphone-only. The client was happy with the modest scaling that took place on tablets, so they only wanted this to work on sub-620px devices. This isn’t unreasonable – the site is a static 940px, so that translates to 2/3 scaling, and we’ve found the site to be quite useful at those dimensions. This tag tells the mobile device “Do not scale this website – use the actual width”. 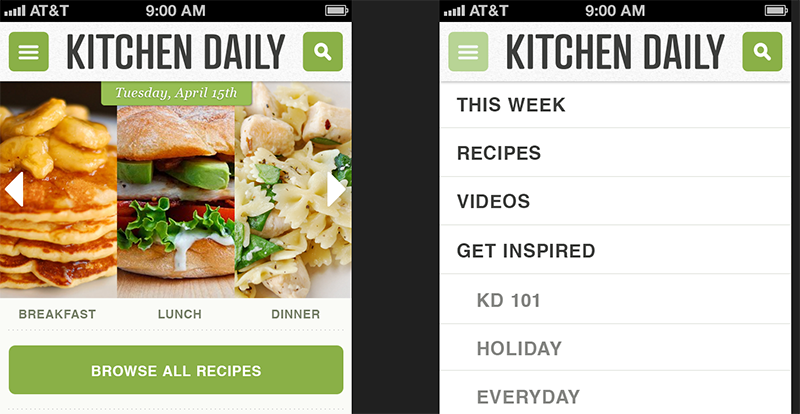 As mentioned before, that’s 940px on KitchenDaily. The problem is, if we add this tag to the header, it stops scaling for all devices – and the client wants scaling to work on tablets. The final script worked pretty well, but the client’s QA team spotted a bug – there was a momentary flash of the full-sized site, scaled down, before the page loaded properly. This was caused by the fact that we had been firing the script in our main JS file, which loads after the document does, for reasons. 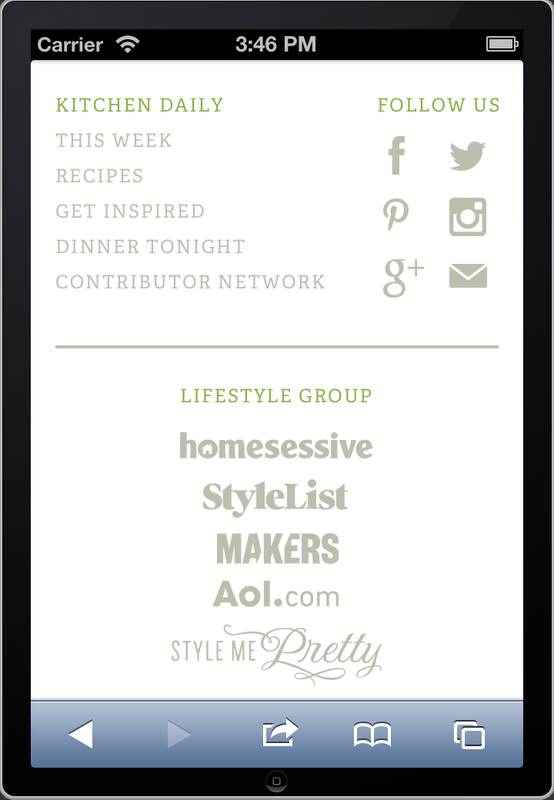 Since the KitchenDaily site is very large, it becomes noticeable. The solution, as suggested by JS/CSS wizard Rachel Nabors (spouse of the author), was to strip out the jQuery in my original solution and move the vanilla js into the header. This turned out to be so useful, we decided to break it out as a standalone script, tidy up the code, and make a minified version for direct use in the header (thus removing an http call). This has been published to Github as setviewport.js. Next, we start shrinking things down to the page width. By resizing the browser to 400px, we get a scrollbar on the bottom of the page. If we then scroll all the way to the right and ‘select all’, we can see the items that are too wide. Using the Chrome inspector tool, we then go down the page modifying elements to width: 100%; and height: auto; until the scrollbar on the bottom of the browser goes away. This process normally takes a few hours – on KitchenDaily it took three days! Thus inserting the ‘Browse All Recipes’ element into the page. Luckily, this homepage-unique element was to be inserted right after a the homepage-unique carousel. We wound up with about a dozen of these kinds of manipulations. This has the effect of sizing the retina sprite to the container in the right proportions, which on retina devices render using the higher pixel density. Magical! The Phase 1 responsive build took over three weeks of coding, testing, debugging and polishing, but was certainly worth it. It gives you the ability to look up a great recipe when you see a sale in the market, send friends a link when you’re having lunch, or follow a recipe when you’re standing at the grill. Getting some releasable code such as setviewport.js was a nice bonus. Onward to Phase 2 – user elements!